On Thursday June 28th, 2012, pediatric residents at Children’s Hospital of Pittsburgh of UPMC participated in the Approach to the Pediatric Trauma Patient course. This course is given on a yearly basis to graduating 1st year pediatric residents before they begin caring for trauma patients in the pediatric emergency department. It addresses a pediatric specific approach to assessment and management of pediatric trauma patients. It includes a self-study online module followed by four simulated patient scenarios managed by residents in groups of 3-4. The residents rotated through four separate patient rooms each containing a Laerdal high-fidelity human patient simulator. 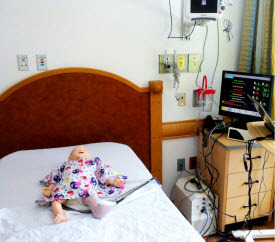 Available simulators for the pediatric residents to train on were SimBaby, SimJunior, SimMan and SimMan 3G.